© 2013 by Charlene; all rights reserved; content may not be copied, rewritten, or republished without written permission. 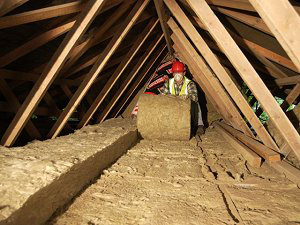 To make your loft as energy efficient as possible, insulation is the single most important item you need to have. It is estimated that up to 25 per cent of heat is lost through the roof. The insulation in the attic should be a minimum depth of about 270mm (10.63 inches) and can save around 175 pounds ($274.14) per year on heating costs. These figures are an average; your true savings depend on where you live and other factors, such as whether you install a radieant barrier. Insulation is easy to install if the loft is easy to access and there are no damp or condensation problems. Well installed insulation will be effective for at least 40 years. It will pay for itself again and again over the years with the reduction in heating and cooling costs for the whole house. If the ceiling joists on the floor are regular, then rolls of mineral wool or fiberglass insulation can be used. The first layer is laid between the joists, and the second layer is cross-laid on top of the first layer up to the required thickness. If the loft is to be used for storage, boards will need to be laid over the joists. To make the insulation effective, rigid insulation boards can be put on the top of the mineral wool. The other option is to raise the level of the floor so that enough insulation can be put in. The mineral wool insulation should not be squashed by the floor boards as this will reduce its effectiveness. 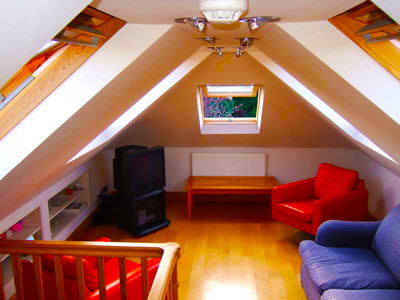 If the loft is to be used as living space, the roof can be insulated instead of the floor. Rigid insulation board can be installed between the rafters and plasterboard or drywall used to cover it. If there isnt much space for thick insulation, the highest quality of insulation board should be used. If it is difficult to access your loft, you can have insulation blown in by a professional. This insulation is fire retardant and made of cellulose fibre or mineral wool. It only takes a few hours to install this type of insulation. Flat roofs should ideally be insulated from above. A layer of insulation board can be put on top of the weatherproof layer or directly on the roof with another weatherproof layer on top of it. Keep in mind that sheathing is now available with a built-in radiant barrier. It is best to have flat roof insulation done by a professional because there may be condensation problems if it is not done correctly. This type of insulation is best done at a time when the roof needs to be repaired. Get 3 FREE Roofing Estimates Now. For any type of loft insulation, a professionals advice should be sought even if you want to do the job yourself. This is because, when the house stays warmer due to the insulation of the loft, the loft will become cooler, which can also cause condensation problems. One of the best ways to keep attic humidity under control is efficient ventilation. Soffit vents are essential of course, but the extraction can be achieved with ridge vents, whirlybird turbines, or solar-powered exhaust vents. When the loft becomes cooler, any pipes and water tanks inside may freeze. They will also need to be insulated. If the water tanks are not easy to access, it would be better for a professional to install the insulation. The loft hatch may also be a place where cool air causes draughts inside the house. This can be prevented by an insulated loft hatch as well as with strips around the edges of the frame that stops draughts. Lofts that are already insulated should be checked for efficiency. According to the Energy Saving Trust, 2012, if everyone in the UK with a loft had 270mm loft insulation, nearly 500 million pounds per year would be saved, and the carbon dioxide saved would be equivalent to removing 100,000 cars from the road. Charlene represents a site called http://www.simplyloftladders.co.uk/. She enjoys writing about home DIY, home design, and home renovation. Please consider supporting Heritage for the Blind.